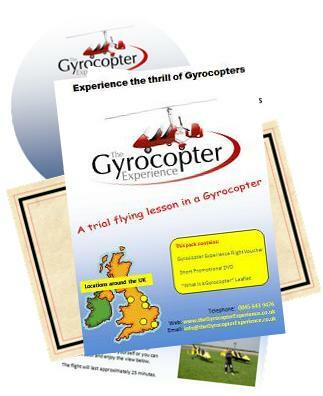 You can buy a Gyrocopter Experience gift pack, containing a short DVD, a flight voucher and an information leaflet. It's a double gift - firstly when they open their present of the gift pack and secondly when they actually take their flight. A voucher can be obtained from your giftpack. If you cannot find your physical voucher then log into this site using the email address or registered username of the person who bought the giftpack and click "My Vouchers". Alternatively email us with your name and the date roughly when it was bought and we will find your voucher number.